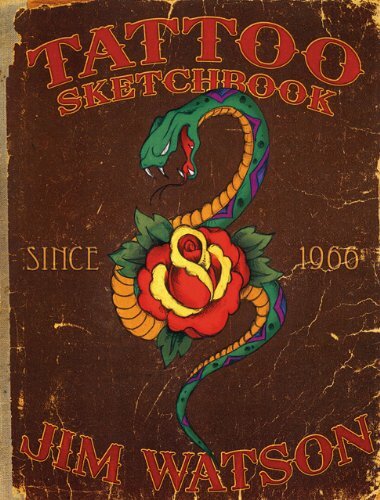 In recent years, the “tattoo artist sketchbook” has become a valuable resource for great tattoo ideas and designs. Although Jim Watson’s tattoo style is normally recognized for being bright and colorful, these sketches show the reader the drawing technique and sketching process of a tattoo artist. The pages contain valuable reference sketches for tattoo artists, and is a great source for easy-to-copy, and easy-to-perform tattoo designs. For anyone who needs to tattoo a “Mom” across a traditional heart, or “Harley-Davidson” down someone’s arm, Jim provides a variety or simple and elaborate “fonts” so you’re sure to have the correct type style for a given situation. Produced on heavy paper with a soft cover, Jim’s personal sketches are bound so the book lies flat on a table, all the better to fully study and utilize the numerous images. This collection will help everyone from new artists to journeymen; as well as their clients, to select (and, if needed, modify) the tattoo that they want and need. Jim Watson began his career in tattooing in the windy city of Chicago starting in the late 1960’s. Much of Jim’s time while in Chicago was spent in Cliff Raven’s tattoo shop, on Chicago’s North side. While there, he focused all of his energy on getting tattooed and soaking up as much tattoo knowledge and technique as possible. Then, in 1971, Jim opened up his own tattoo shop in the Capital Hill area of Denver, Colorado. After 4 successful years in Denver, Jim moved and settled in Phoenix, Arizona where he continued to tattoo. Today Jim owns and operates Artistic Skin Design located in Arizona. Although Jim no longer works out of the shop on a day-to-day basis, he still has been known to perform the occasional tattoo for friends, family, and by special appointments.